I’m sitting at lunch with brilliant Jessica Amen (also, isn’t that the coolest name evvvverrr?) She’s showing me how to navigate my new-ish Genius Bar-fixed computer. Oy. 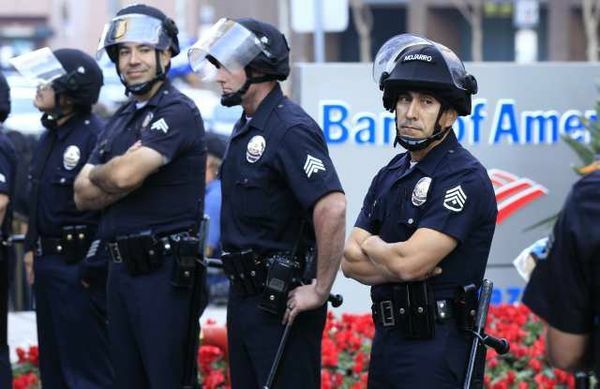 On Thursday, police in downtown L.A. swooped in to arrest dozens of protesters from the Occupy LA movement. Among those seized and hauled off to jail was Nancy Linehan Charles, a veteran theater actress and a leading member of L.A.’s Salty Shakespeare company. The actress said in a phone interview Friday that she was participating in the protests with her son, actor Will Rothhaar, when they were arrested by police, along with many others. She said she was arrested around 9:20 a.m. Thursday and was held in a downtown jail for nearly 13 hours before being released on bail. Salty Shakespeare is a nontraditional theater company that performs impromptu scenes from the Bard’s plays in public places. While in jail Thursday, Linehan Charles said she performed snippets from “Othello” and “A Midsummer Night’s Dream” for her fellow detainees. The actress, who lives in Santa Monica, said that she was bailed out with the help of the Service Employees International Union, which was involved with some of the day’s protests in downtown and in other cities. Linehan Charles has acted with many L.A. theater companies, including the Geffen Playhouse, the Pacific Resident Theatre, the Falcon Theatre and the Colony Theatre. Photo: Top, police in downtown Thursday face off with protesters from Occupy LA. Credit: Lucy Nicholson / Reuters. 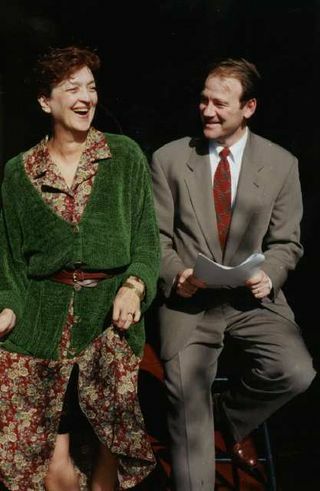 Lower, Nancy Linehan Charles and Michael Tulin in a 1997 production of Truman Capote’s “A Christmas Memory” at the Pacific Resident Theater.